Abstract: Public services require computer-based electricity supply. Not continuous electricity supply in some areas led to a power supply from an alternative power source becomes indispensable. One alternative power source is a solar cell. Solar cell is a sustainable source of electricity but power output is not constant depending on the sunlight. The power source is needed to anticipate the lack of power when the power generated by the solar cell is not enough.In this paper proposed a hybrid design that combines the power supply of electricity from the solar cell, the network provider of electricity, and batteries. This paper discusses methods of hybrid electric power from three sources. Hybrid power is usually done by PCC (Power Controlled Converter), which consists of a controlled power converter for each channel input, but in this study the method proposed hybrid power input specification in the form of a synchronization circuit PCC then replaced by a diode circuit.The design of hybrid power supply in this study resulted in the specification input from the solar cell with Vmp channels (maximum power voltage) 35VDC Voc (open circuit voltage) 43.78VDC, channels of electricity provider with the already converted with SMPS (Switched Mode Power Supply) to 35VDC, and channels of a battery with a minimum voltage of 21VDC maximum 27.6VDC. The test results showed that the implementation of the proposed hybrid method can perform a single capture or hybrid power, and can transfer power between the source retrieval without pause. Implementation of the proposed hybrid method has a 21VDC output voltage range - 43.78VDC and efficiency of 98.6% - 99.5%. 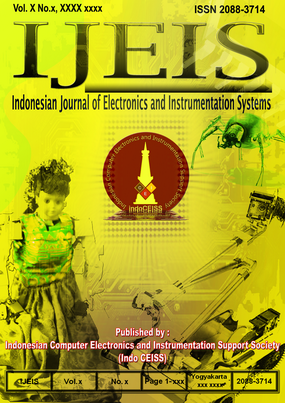 Abstract: The development of quadrotor type AR. Drone for research are being developed. One of which is an object detection system based image processing to perform the mission, such as tracking, landing, or detect and pass the object hitch. Accordingly, in this research designed an ARTag detection system based on digital image processing using OpenCV library implemented in ROS platform used to connect the drone to PC which will then be carried out missions to landing. The method used is Thresholding, Contour Detection, and Image Moments. The result of this research is a system that able to detect ARTag objects along with his ID. The system is tested by computing time of the program in the static and dynamic state, detection performance testing in static and dynamic state, detection performance testing of the angle between the ARDrone and ARTag, detection performance testing of the light intensity, and testing landing mission. The conclusions are the optimal height of detection in the static and dynamic state is 150 cm, has excellent reliability to the light intensity, and the ARDrone can perform landing mission with a success rate of 70%. Abstract: Density is a measure of the mass of volume unity. How to measure density in general by measuring the weight and dividing it by the volume of liquid, so in this way the measurement is not. Measurement of the density of the liquid based on the ultrasonic velocity becomes an alternative so that the measurement can be done directly, accurately, practically, and easily.Ultrasonic velocity becomes the variable to determine the density of the liquid. Time synchronization begins when the ultrasonic transmitter emits ultrasonic and is terminated when the receiver receives ultrasonic. The discrete ultrasonic wave transmission method is performed when the ultrasonic receiver receives transmittance from the ultrasonic transmitter then the 40KHz signal pulse is stopped and ultrasonic transmission is repeated up to 10 times the measurement data.From this study obtained some conclusions. Ultrasonic velocity is influenced by the viscosity of the liquid, ultrasonic velocity through 1394m / s aquades, ultrasonic velocity through cooking oil 1387m / s, ultrasonic velocity through liquid soap 1175m / s, ultrasonic velocity through liquid soap solution 40% 1317m / s , Ultrasonic velocity through liquid soap solution 70% 1257m / s, velocity measurement deviation of 0.43% and 0.01% density calculation type. Abstract: Pump test bed is essential to ensure the proper functioning of a pump. However, a conventional pump test bed has some limitations during measuring the flow properties and variating the pump speed. As a result, a digital pump test bed can be a solution for measuring the flow properties more accurately. This article describes the construction process of a pressure sensing module for a digitalized pump test bed and control of flow by varying the speed of a prototype DC pump. A pressure sensing module and flow control system are constructed in this study to develop a prototype pump test bed as well as change the speed of the centrifugal pump. It is found that by using a piezoelectric pressure sensor in delivery pipe, the pressure sensing error is only 6.3% at the designed speed of pump and can be minimized by calibrating the sensor, fixing the leakage problem and increasing the pressure of flow. A wide variety of pump speeds can also be obtained by applying pulse width modulation principle without stopping the power supply. Abstract: Urgency usefulness of online learning system based on social constructivism which is the mobile virtual classroom learning philosophy is of concern, because the system is built on the pattern of reciprocity between users in order to produce the most quality materials see the absence of a system that provides online learning for it. Content of lecture materials that have been divided into certain categories are processed into virtual versions and delivered lightly. The recommendation system is designed to respond users who have rated it by providing good quality course material. Software is created with Unity Engine and incorporated the recommended system protocol with data stored in a scholarly research database. The recommendation system implemented is the items based collaborative filtering with the specification of training data used are 401 rating data, 51 records and 17 users. With sparsity data training amounted to 53.74%, tested the prediction accuracy resulted RMSE 0.91523 and the accuracy of 81.69%. The mobile version of virtual class that has been planted with recommendation system is tried and tested on several brands of android smartphone. Results obtained on the questionnaire resulted in a rating of 4,762 on performance and 4,572 against the intellectual class software interface. Whereas the level of user enthusiasm for the virtual class reaches 4,0588 on a scale of 1 to 5. Abstract: Image are objects that have many information. Gray Level Co-occurrence Matrix is one of many ways to extract information from image objects. Wherein, the extracted informations can be processed again using different methods, Gray Level Co-occurrence Matrix is use for clarifying brain tumor using Convolutional Neural Network. The scope in this research is to process the extracted information from Gray Level Co-occurrence Matrix to Convolutional Neural Network where it will processed as Deep Learning to measure the accuracy using four data combination from TI1, in the form of brain tumor data Meningioma, Glioma and Pituitary Tumor. Based on the implementation of this research, the classification result of Convolutional Neural Network shows that the contrast feature from Gray Level Co-occurrence Matrix can increase the accuracy level up to twenty percent than the other features. This extraction feature is also accelerate the classification process using Convolutional Neural Network. Abstract: Landslides are one of the natural disasters that often occur in Indonesia. Therefore, this disaster cannot be eliminated, but it can minimize the disadvantage caused by an early warning mechanism. Early warning systems rely on a sensor node used to read soil conditions with specific parameters. Those parameters that are read lead to the detection of mass movements. With the tightness of the monitoring process, of course, a reliable sensor node is needed. However, there are challenges in how to minimize losses that occur due to damage to sensor nodes when landslides occur. Sensor nodes are made using IMU sensors to monitor mass movements and its use two processors, namely microcontroller and mini SBC, which are inexpensive to manufacture and do not require large space in the installation. Abstract: One of the diagnosis procedures for acute lymphoblastic leukemia is screening for blood cells by expert operator using microscope. This process is relatively long and will slow healing process of this disease which need fast treatment. Another way to screen this disease is by using digital image processing technique in microscopic image of blood smears to detect lymphoblast cells and types of white blood cells. One of essential step in digital image processing is segmentation because this process influences the subsequent process of detecting and classifying Acute Lymphoblastic Leukemia disease. This research performed segmentation of white blood cells using moving k-means algorithm. Some process are done to remove noise such as red blood cells and reduce detection errors such as white blood cells and/or lymphoblastic cell that’s appear overlap. Postprocessing are performed to improve segmentation quality and to separate connected white blood cell. The dataset in this study has been validated with expert clinical pathologists from Sardjito Regional General Hospital, Yogyakarta, Indonesia. This research produces systems performance with results in sensitivity of 85.6%, precision 82.3%, Fscore of 83,9% and accuracy of 72.3%. Based on the results of the testing process with a much larger number of datasets on the side of the variations level of cell segmentation difficulties both in terms of illumination and overlapping cell, the method proposed in this study was able to detect or segment overlapping white blood cells better. Abstract: Self-sufficiency programs in the new government era program to regain food self-sufficiency that was once achieved. This is found in one of the new government initiatives, namely to realize national independence by mobilizing strategic sectors of the domestic economy, one of which is in the agricultural sector through efforts to build and realize food sovereignty. Based on this and in an effort to realize food sovereignty, the author made technological innovations in the form of prototype design of the village-based irrigation network monitoring system so that it can be accessed from various types of devices and can be accessed anywhere while the technology developed uses a single board computer (SBC) with sensor devices that have a detection distance of 2–300 cm and with a network model based on mesh topology which has a transmission distance of approximately 1200 meters outdoor between node points. Data transmission results between node points indicate that the water level data update time is every 60 seconds with the sending time to the server database on average every 60 seconds.